El Salvador's constitutional crisis is officially over. The National Assembly has re-elected the magistrates to the classes of 2006 and 2012. The four judges of the constitutional chamber including Belarmino Jaime continue with their roles set out in El Salvador's constitution. The Supreme Court has a new President, Salomón Padilla. What are the lessons of this protracted crisis? The next presidential election in El Salvador will not be until March 2014, but we already know the candidates for El Salvador's two leading political parties. This week the right wing ARENA party announced that its candidate will be Norman Quijano, the popular mayor of San Salvador. Earlier this year, Quijano won election to a second term as mayor by a landslide. As mayor of the country's largest city, he has already shown the ability to gather significant support and is viewed as someone able to get things done. The FMLN had earlier announced that its candidate will be Salvador Sanchez Ceren, the current vice-president. 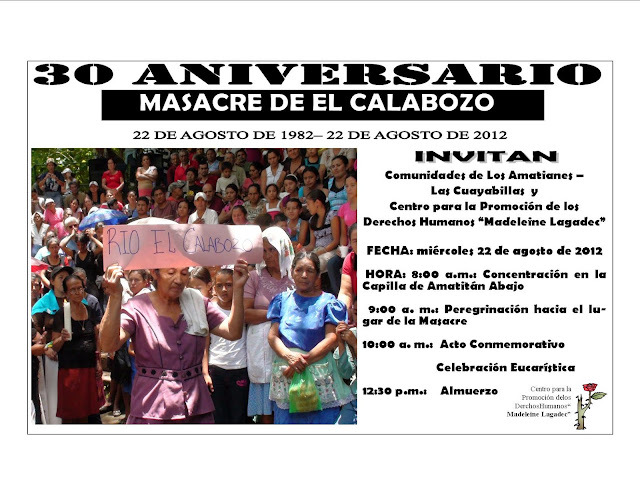 On Wednesday August 22, people will gather at the church in Amatitán Abajo, in San Vicente Department, to commemorate, remember and demand justice for a massacre which happened thirty years ago. It is the anniversary of the El Calabozo massacre, when troops of the US-trained Atlacatl Battalion murdered more than 200 civiliam victims taking refuge along a river's banks. After 17 negotiating sessions presided over by president Mauricio Funes, the leaders of El Salvador's political parties have reached an agreement which would appear to bring an end to El Salvador's ongoing constitutional crisis. The agreement apparently came when the parties agreed to elect José Salomón Padilla as president of the Supreme Court and the Constitutional Chamber, in place of Ovidio Bonilla who had been elected in April. Belarmino Jaime and the other judges elected to the Constitutional Chamber in 2009 will continue in those roles. The judges originally elected in 2006 and 2012 will be re-elected. The announcement from the office of president Funes, and a copy of the agreement signed by the parties can be seen at this link. I'll have some analysis about what this resolution means for Salvadoran democracy and governance in a later post. The Central American Court of Justice (CACJ) issued its ruling on the constitutional crisis in El Salvador. The CACJ ruled in a 5-1 decision, that the decisions of El Salvador's Constitutional Chamber, which invalidated the elections of magistrates in 2006 and 2012, were themselves invalid. The CACJ decision spends most of its time asserting the basis for its claim of jurisdiction over this internal Salvadoran constitutional conflict. Once the CACJ decided it had the power to rule on the conflict, its analysis of the actual dispute is trivial. The CACJ decision boiled down to saying that since no one from the Constitutional Chamber showed up to dispute the petition of the National Assembly, the legislature wins. My friend Danielle Mackey has a powerful article in the National Catholic Reporter telling the story of Patricia Garcia, one of the activists of the Committee of Mothers of Political Prisoners and the Disappeared (COMADRES), titled A Life Committed to Finding the Truth. This week El Salvador's Ministers of the Environment and of the Economy announced that they have sent a draft law to the National Assembly which would suspend all metallic mining activity in the country. The law is intended to suspend all such activity until El Salvador has the necessary structures in place to control the environmental and social impacts of mining. This suspension will apply to existing exploration and exploitation permits as well as putting a hold on any new applications. A Monitoring Committee would be created to determine when conditions have changed such that mining activity might resume. This draft law is the outcome of the Strategic Environmental Evaluation prepared by the Spanish consulting firm, the Tau Group. I provided an overview of that report in this blog in March which you can read here, and that entire report is available at this link. Is smarter US aid helping El Salvador's crime issues? After seven negotiating sessions at the Presidential Palace, the leaders of El Salvador's political parties have reached a small level of agreement. All parties have agreed to re-elect the 2006 class of magistrates. With respect to the 2012 class of magistrates, the parties have agreed to the list of names of 11 lawyers from which they will elect the magistrates, but they have not agreed on what roles on the court those lawyers might be elected to. Thus ARENA leaders have made it clear that they do not want Ovidio Bonilla, the magistrate who was elected president of the Supreme Court in April 2012, to be the president of the Supreme Court. Now that they have the votes to block a two-thirds majority, they are insisting they will not approve the selection of a court president who they believe has strong ties to the FMLN. VMM-USA is sponsoring a delegation to El Salvador from October 28 - November 4, 2012. Sign up is open to anyone with a spirit of solidarity for the people of El Salvador. I'll be on the trip to share my knowledge and passion for the country, and a special part of the trip will be the presence of Edwina Gateley, poet, theologian, artist, writer, lay minister, modern-day mystic and prophet, and a single mom. You can read more about the delegation at this link. This delegation is also supported by the efforts of the SHARE Foundation.